The trailhead for Lead Cove Trail is on Laurel Creek Road at 5.5 miles west of the Townsend “Y”. 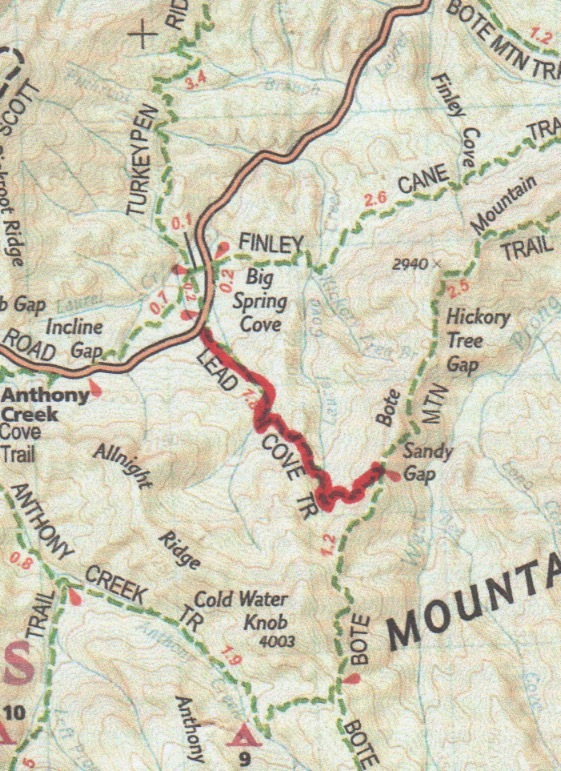 The trailhead is shared among Finley Cane Trail and Turkey Pen Ridge Trail, giving 900 Milers several options for loop hikes. The trail was originally named Sandy Gap Trail as it terminates at the Bote Mountain Trail at Sandy Gap but it was refurbished and renamed in 1970. The trail is the remains of old wagon trails that permeated the farmlands that once made up this area of the park. There is plenty of water but no campsites along this path. The trail climbs steadily along it’s length. At 0.4 miles it crosses Sugar Grove Prong on an easy rock hopper. Just past Sugar Grove Creek, there are clearings where once stood the Gibson-Tipton Cabin. The next creek crossing is at 1.4 miles over Laurel Cove Creek. The steady climb continues up the flank of Bote Mountain until you reach Sandy Gap at 1.8 miles and the terminus at Bote Mountain Trail. This entry was posted in Trail Log and tagged Lead Cove Trail on May 12, 2016 by blogginggazelle.